NASA's Spitzer Space Telescope has imaged a wild creature of the dark -- a coiled galaxy with an eye-like object at its center. The black hole is huge, about 100 million times the mass of our sun, and is feeding off gas and dust along with the occasional unlucky star. Our Milky Way's central black hole is tame in comparison, with a mass of a few million suns. 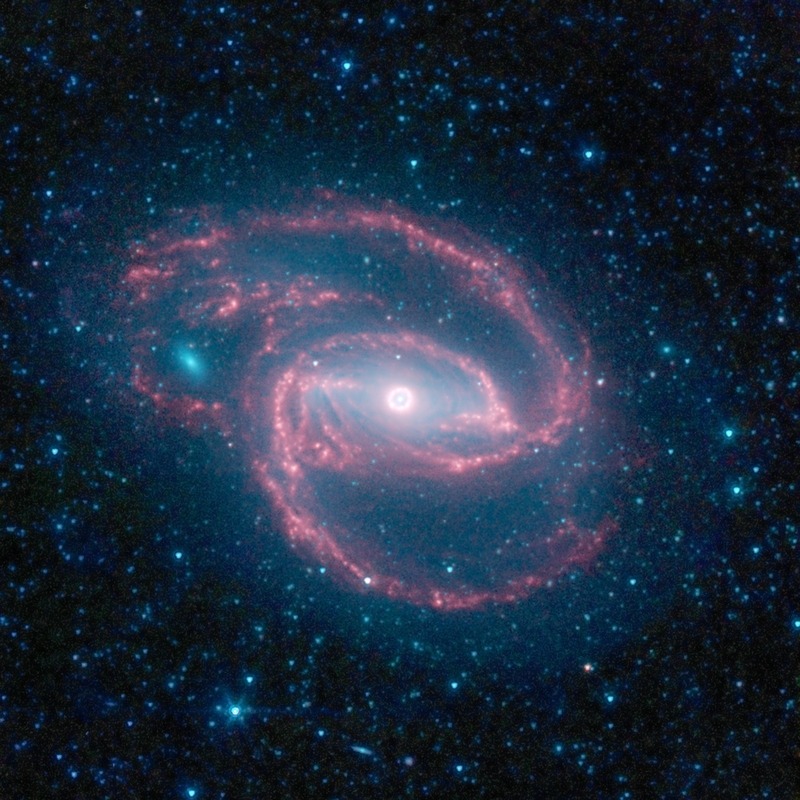 The galaxy's red spiral arms and the swirling spokes seen between the arms show dust heated by newborn stars. Older populations of stars scattered through the galaxy are blue. The fuzzy blue dot to the left, which appears to fit snuggly between the arms, is a companion galaxy. Astronomers say it is unclear whether this companion poked a hole in the larger galaxy, or just happens to be aligned in a gap in the arms. This image was taken during Spitzer's cold mission, before it ran out of liquid coolant. The observatory's warm mission is ongoing, with two infrared channels operating at about 30 Kelvin (minus 406 degrees Fahrenheit). Infrared light with a wavelength of 3.6 microns is blue; 4.5-micron light is green and 8.0-micron light is red. The contribution from starlight measured at 3.6 microns has been subtracted from the 8.0-micron image to enhance the visibility of the dust features. C.5.1.2 C.5.1.7 C.5.3.3 C.5.3.2.2 C.5.5.1.